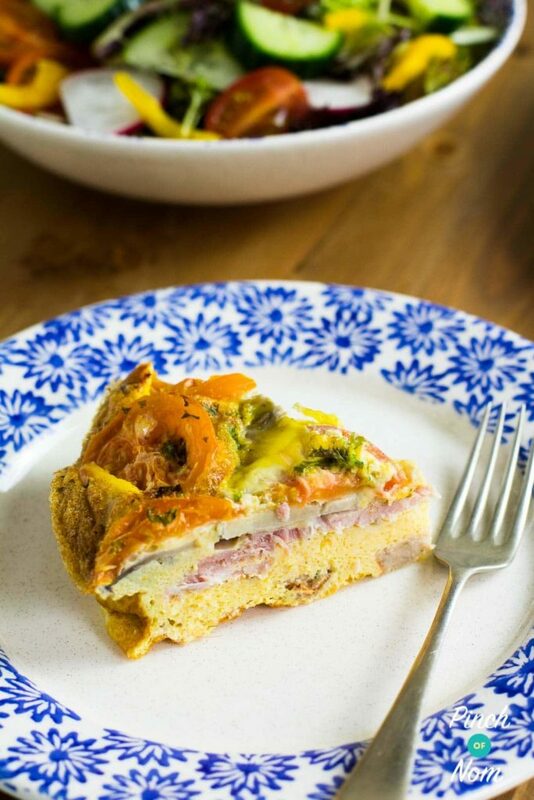 This Breakfast Quiche is an easy, tasty breakfast you can enjoy when calorie counting or following plans like Slimming World or Weight Watchers!. 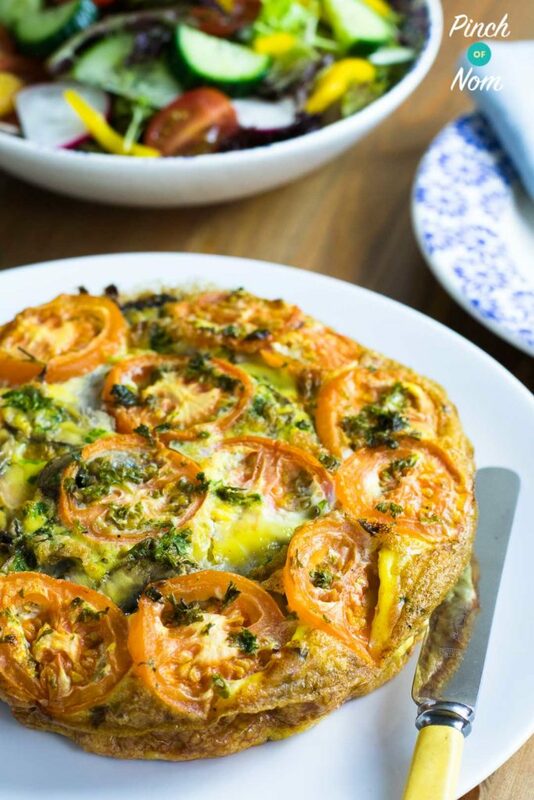 This Breakfast Quiche isn’t just for breakfast, you can have it for lunch, dinner, to snack on through the day, or with the nice weather on the way (hopefully!) it’s a perfect slimming friendly picnic option. You’ll notice that we’ve added a couple of tablespoons of Quark to the mix, to make the egg a bit creamier. However, if you’re one of those people that really can’t stand Quark you can leave it out. 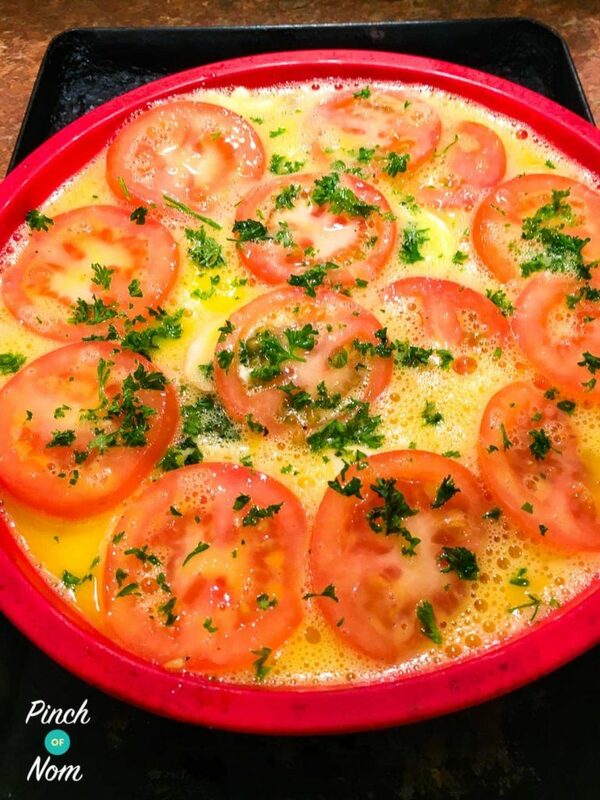 How do I make this Breakfast Quiche? The first thing you’ll need to do is cook your bacon medallions and sausages. You can do this in advance and keep them in the fridge until you’re ready for them. You can find out some more details about the sausages we use below. Next you want to create a layered effect with the ingredients. 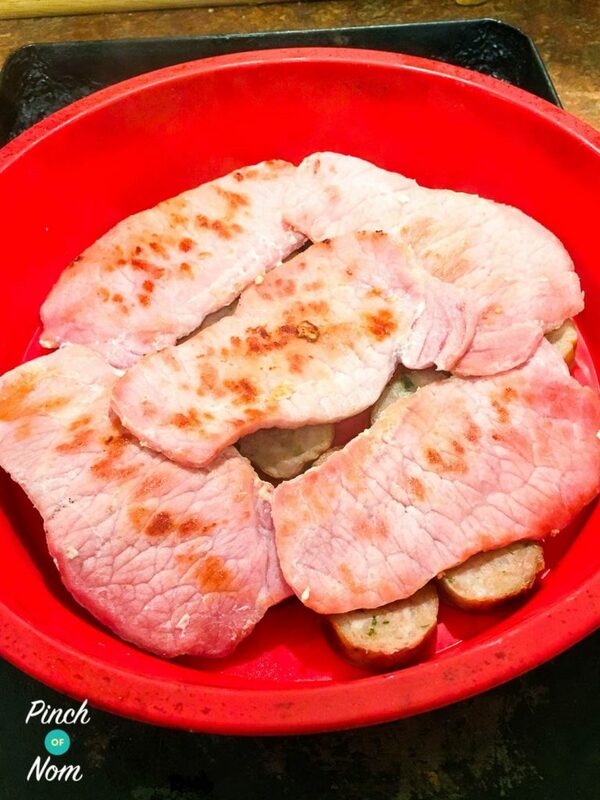 First, arrange the cooked sliced sausage in the silicone mould. You don’t need to grease or spray the mould with low calorie cooking spray, as the quiche should pop out quite easily once it’s cooked. Next add the cooked bacon medallions, there’s no need to cut them up. Add the sliced mushrooms on top of the bacon, and finally finish with a layer of sliced tomato. 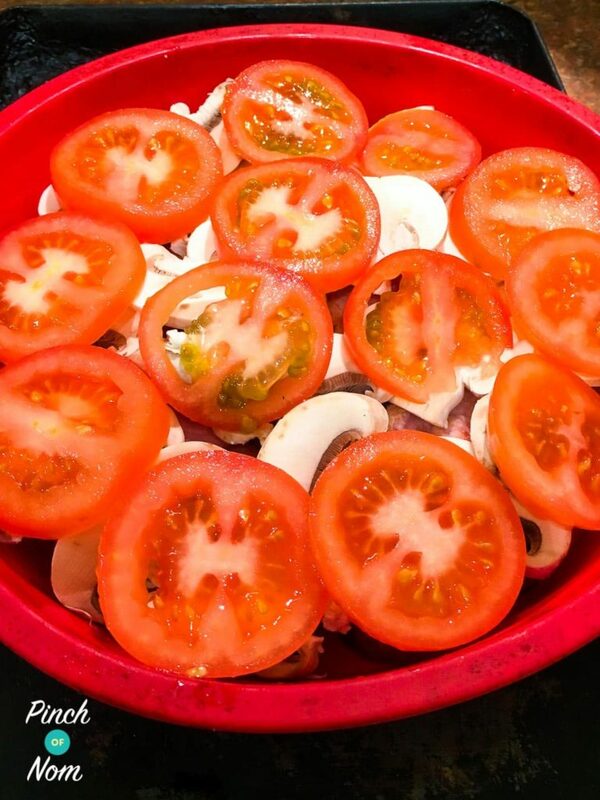 The bacon, mushroom and tomato layers will float in the egg mixture, so when the quiche is cooked you should have a layer of tomato, then one of mushrooms, then bacon followed by the egg and finally a layer of sausage on the bottom. Of course there’s nothing to stop you chopping up the bacon, and mixing it with all the other dry ingredients, then adding the egg. But I think the layered effect looks far more impressive! We use a silicone mould as there’s no need to spray with low calorie spray to prevent the Low Syn Breakfast Quiche from sticking. 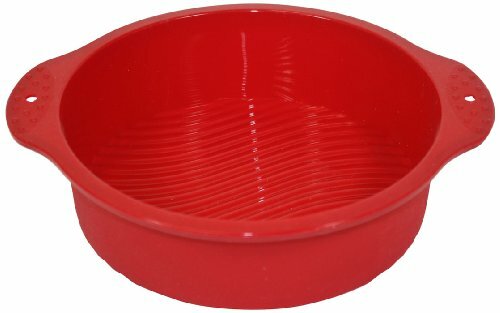 If you don’t have one, you can buy them over on Amazon. What sausages should I use for this Breakfast Quiche? 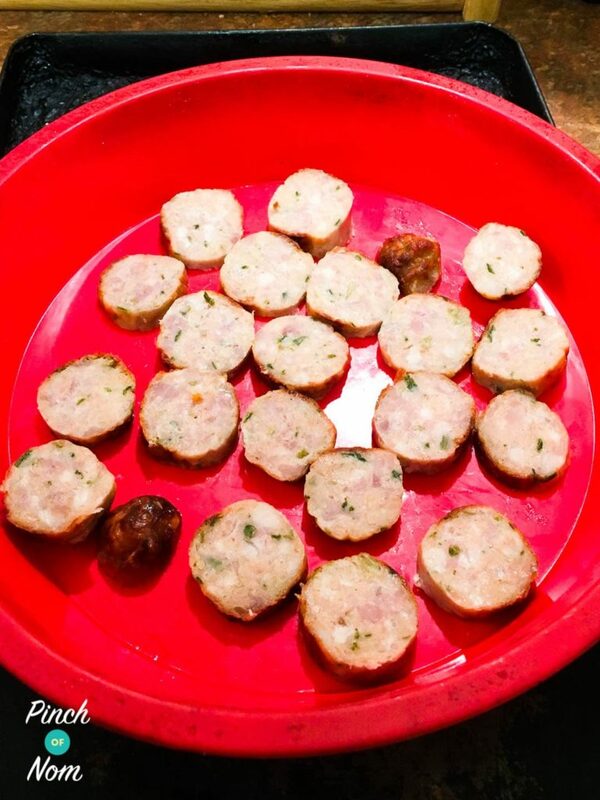 Most supermarkets have a low calorie sausage product, and most are great for this recipe! Check how the ones you pick fit into any plan you are following. Heck also offer some great sausage options. Most of their chicken sausages (there are a few different varieties) are much lower in fat and calories than a traditional sausage, and well worth a look. As above, remember to check the calories, Syns and Points if that’s important to you! You’ll find that choosing which sausages to use is the hardest part of this recipe, it’s so simple, and perfect for a filling breakfast or lunch! How many calories is this Breakfast Quiche? 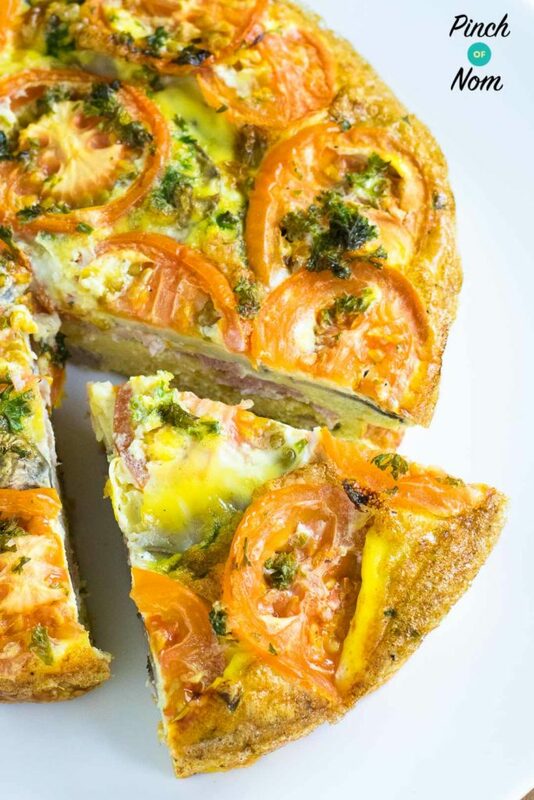 There is around 179 calories in each serving of this breakfast quiche. This estimate is based on an average low fat sausage, so for a more accurate calorie count you will need to log into an app like My Fitness Pal and enter the ingredients with the specific values of the sausage you choose. How Slimming World friendly is this Breakfast Quiche? The only Syns in this Breakfast Quiche come from the sausages chosen. The ones we used were 1 Syn each, making it 0.5 Syns per portion. 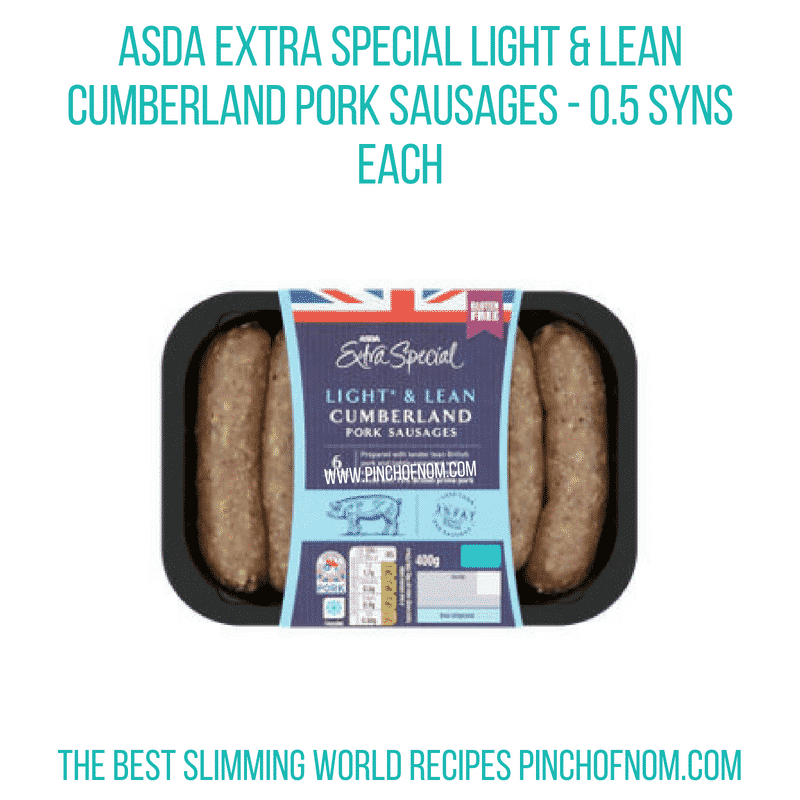 That said, you could use the Slimming World Sausages to make this Syn Free. Whatever you chose, make sure to account for it in your daily Syns! 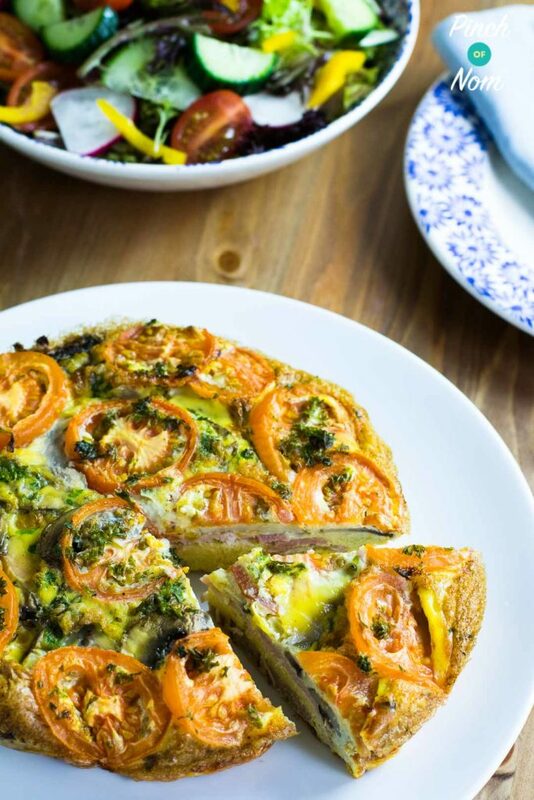 How Weight Watchers friendly is this Breakfast Quiche? Based on an average low calorie sausage there is only 1 Point per serving in this Breakfast Quiche! To get the most accurate Points, use the WW app to log the ingredients and the sausages you choose to use. 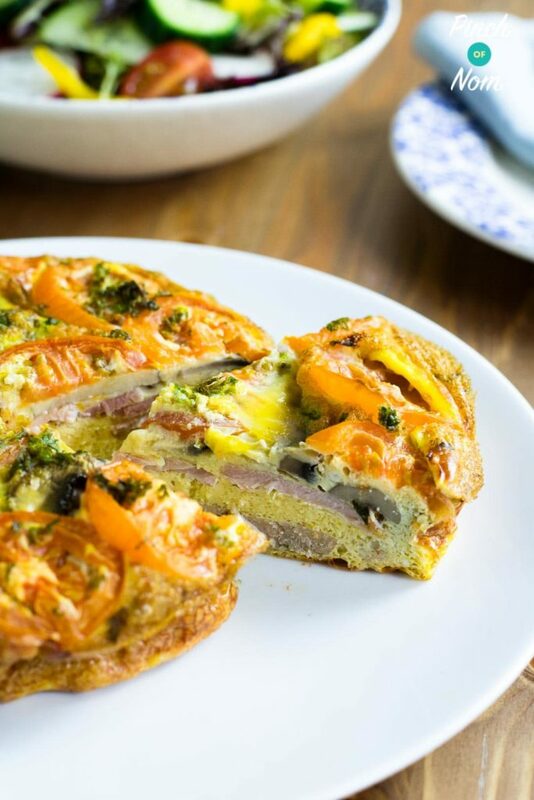 Want to save this Breakfast Quiche for later? Pin it to Pinterest! Serve warm or cold with a good helping of vegetables! Hi Kate if i do this quiche without the quark, i don t eat dairy, would it still be has good. Yes you can leave out the quark and it will still taste great! Hi can you use ham hock instead of bacon and sausage please ? Yes you can. The good thing about quiche is you can put pretty much whatever you want in it! If i freeze the quiche, how long do I leave it till it thaws? The safest way to defrost would be in the fridge overnight. Hope this helps. Thanks for getting in touch. So glad you’re enjoying the recipes! I made this for tea tonight but instead of using sausages I used slimming world meatballs and it was gorgeous!definitely one of my new favourites!